Just before Christmas we shared the biggest political scandals of 2017, and what a list to choose from! Now, as we prepare for the year ahead, here’s 5 of our hopes for the change 2018 can bring. 2017 was the year Brexit was supposed to shift from slogans to strategies. Fresh from fighting in the courts over who triggers Article 50, the government looked hell-bent on imposing its own vision of Brexit, leaving the public and even MPs on the sidelines. We published our reportDemocratic Brexit: avoiding constitutional chaos in Brexit Britain. Campaigners and politicians alike armed with it have been making the case to seize the opportunity of Brexit to renew our democratic system, not fall back on archaic, centralised powers going back to the middle ages. Unlock Democracy built a coalition of campaigners and charities of every kind to stop the EU Withdrawal Bill being a blank cheque for ministers to reshape vast swathes of government policies without effective scrutiny. So far, we’ve forced climb downs of protecting human rights and a meaningful vote in Parliament on the final Brexit deal. In 2018 we’ll keep working with our friends across the movement to demand a people’s Brexit, not an establishment Brexit. After rumours broke of sitting MPs breaking strict legal limits for spending during the 2015 election campaigns, we helped sound the alarm. After working closely with Channel 4 on their expose, in 2017 we kept on the pressure for the Criminal Prosecution Service to take the evidence they had to court. Most of the candidates got off scot free, but one MP is going to court in May. We can’t allow parties with the most cash buy our elections. So in 2018 we want to see new rules that make spending laws mean something in practice. Millionaires continued stuffing the pockets of political parties in 2017. We also found out that just 10 people funded both sides of the EU referendum campaign. We launched our light-hearted guide How to be a dodgy donor to draw attention to a very serious problem with our political system. When Theresa May announced her snap election, we were ready to shine a light on who was trying to buy a certain outcome. Labour made up the difference with union money and small donations, but the two main parties still spent much more than all the others. Yet again 2017 showed how much money you have decides how many votes you get. And how can we forget the £425,000 funnelled through the Democratic Unionist Party to avoid transparency rules? In 2018 we want to see action to close the loopholes and crack down on big money in politics for good. With 22 million votes wasted and wide-spread tactical voting, we don’t need to be told again how unfit our voting system is, but the 2017 election really showed us. 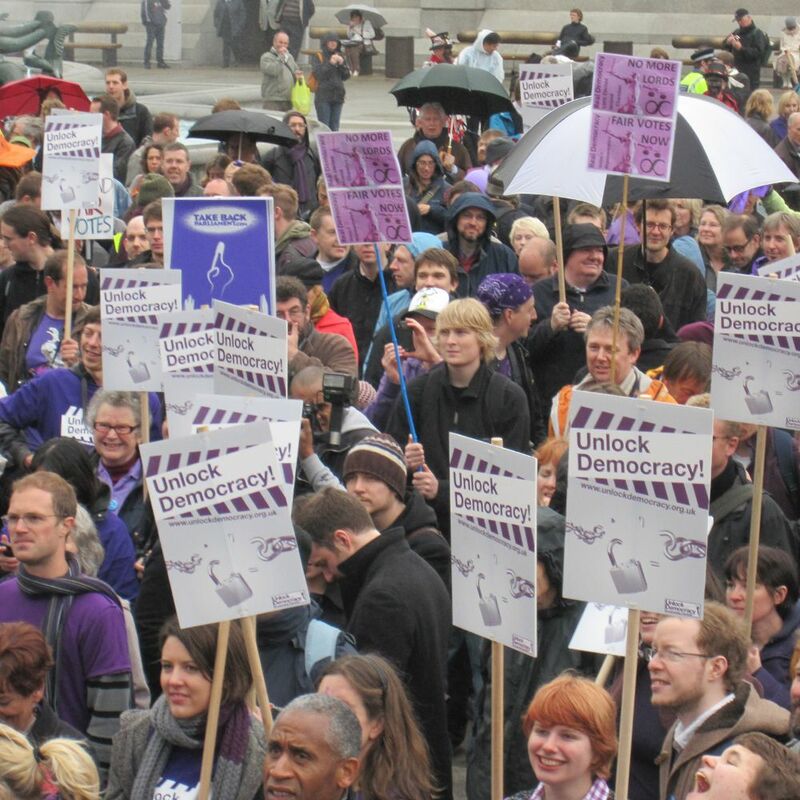 Last year with our friends at the Electoral Reform Society and Make Votes Matter, you helped smash the 100,000 petition signatures needed to make Parliament debate proportional representation. 2018 marks a hundred years since some (but not all) women got the vote for the first time. What legacy could be better than making it the year all women’s votes now count in a proportional voting system? 2017 was the year that finally broke the UK’s antiquated unwritten constitution. Without proper rules saying what the government can and can’t do it’s been bogged down in the courts. Non-binding, makeshift rules guiding relations between the UK’s different countries has made confusion and political drama a daily event. Delivering Brexit is the biggest constitutional change for half a century, we can’t make it up as we along anymore. Our Democratic Brexit report set out the first steps to fixing this in time for Brexit. But in 2018, we’ll be loudly campaigning for a new, more democratic constitution the public have a say in writing.